Documentary series. It's spring in the polar regions and, after a five-month absence, the sun reappears. The greatest seasonal transformation on our planet is under way. Browse content similar to Spring. Check below for episodes and series from the same categories and more! The sun is absent for up to half the year in the polar regions. its warmth will transform this magical ice world. The greatest seasonal change on our planet is now underway. Antarctica is still locked in ice, and surrounded by a frozen ocean. Adelie penguins are arriving - just the males. and now they're in a hurry, for spring will be short. and now they're returning to breed. so they have to come here, where there is bare rock. when they at last arrive. An impressive property demonstrates your worth as a mate. and finding ones that are just right is not easy. So some penguins turn to a life of crime. that the thief is just over his shoulder, and looking for more. does lift the temperature by a few degrees. That, however, can have unexpected, even dangerous consequences. pulling cold air from the middle of the continent towards the coast. These katabatic winds are stronger than any hurricane. They are the coldest and the most ferocious on the planet. and are the reason that spring here is, in fact, the deadliest season. Here, early birds take a great risk. when they finally decide to turn up. Spring in the north of our planet. breaks the horizon for the first time. A female polar bear emerges from her den beneath the snow. The sun must be a welcome relief after so long in the darkness. it'll be a rare achievement. and will be fortunate to survive these early weeks. and the smaller cub will quickly gain size and strength. The sea ice, though, is a dangerous place. and a bear cub would certainly make a welcome snack. and now is the time when they have their pups. and cracks created by the fluctuating tides. Both are good places to look for seals. He has detected a seal den beneath the ice. Now he must pin-point it, using only his extraordinary sense of smell. the seal will certainly escape. and her pup has climbed up on to the surface. It's more exposed up here, but it's easier to see an approaching bear. The pup is well camouflaged. Difficult to see when its mother has left it to go fishing. But he can still smell it. Nine out of ten polar bear hunts end in failure. and the sea ice is showing the first signs of weakening. Inland, the northern rivers are still locked in ice. that has not moved for almost six months. but as spring advances, it beings to stir. The frozen waterfalls start to weaken. Above them, the pressure is mounting. Now, from high above, whole sections can be seen to be on the move. that is building up above them. and the river is unleashed. driven by the unstoppable force of the meltwater. Boulders and trees are plucked from the bank side. Within just a few days, the rivers of the north are all running. The Arctic's fresh water is flowing again. and as they enter the ocean, they accelerate the break-up. will vanish from the Arctic Ocean. As the huge ice-sheet breaks up, wildlife returns to the North. but the smallest cub is nowhere to be seen. who now have more milk to share. the mother's next challenge is to catch a seal. Not easy with these two in tow! And this is not the stealthiest of hunting parties. a male bear would eat one in a moment. but they're still young enough to accept their mother's discipline. It's the naughty corner for you! This is not going to be their lucky morning. They saw no sign of a seal and the cubs are hungry again. and now her milk is drying up. She must catch a seal soon, or the whole family will starve. The challenge of finding food is getting harder. and it's breaking up faster with each passing day. Even the ice around the coast is starting to break. in the bays that have been frozen up all winter, but are now opening up. temporary cracks in the ice. cutting off the air that they need to breathe. The road narrows until there's barely room for one-way traffic. narwhals coming from the other direction. Each team faces an armoury of sharp tusks. and everyone continues in the same direction. and the narwhals turn their attention to social matters. No-one knows exactly what the narwhal's tusk is for. yet these exchanges are too gentle to be real fights. are to remind each animal of where it stands in narwhal society. Bizarre creatures appear as if from nowhere. brought down by the great rivers and released from the melting sea-ice. into dazzling bursts of colour. flies through the water on translucent wings. It's on the trail of a peculiar swimming snail. and predators travel hundreds of miles to feast on them. for the birds and seals of the far North. and the breaking sea ice make the Arctic Ocean teem with life. The land is also transformed by the sun's heat. so they absorb more of the sun's energy. The Arctic tundra is unveiled. so their flowers are always warmer than their surroundings. than nectar if they're to stay active in the cold. and the story of how it does so is truly astonishing. as indeed it must, for this far north, the season will be brief. got enough reserves to transform itself into a moth. so it settles down beneath a rock. The sun's warmth rapidly dwindles. but the cold penetrates deep into the ground. Soon, its heart stops beating. first its gut, then its blood. After four months of darkness, the Arctic begins to thaw. And the caterpillar rises from the dead. in the early spring, the woolly bear is already eating. and the cold closes in once again. But eventually, a very special spring arrives. This one will be its last. It's now 14 years old - the world's oldest caterpillar. Its remaining days now become frantic. It starts to weave a silk cocoon. abilities that will be crucial in the days ahead. It's waited over a decade for this spring and now, its time is near. All across the Arctic, moths are emerging. they now have just a few days to find a partner and mate. or the struggle to survive in this most seasonal of places. the transformation of the tundra continues. and suddenly the tundra is alive with birds and chicks. The Arctic's transformation is complete. This influx of life is good news for some permanent residents. Food is rarely plentiful out on the tundra. The Arctic wolves must make the most of this boom while it lasts. The wolves must gather as much food as they can. Many miles from here, other members of the pack are relying on them. forcing wolf packs to be smaller here than further south. Six hungry mouths to feed. The cubs are just over a month old. and one the cubs seem to be particularly keen on. but there will be no leftovers today. The cubs are growing fast and are always hungry. of the Arctic's less welcoming side. Their coats are pale to conceal them during the long, snowy winter. this land was a barren, white desert. the Antarctic sea ice is still at its greatest extent. that the sea ice never quite reaches. takes the edge off the vicious southern winter. like the wandering albatross, to live here throughout the whole year. so they have no choice but to sit here throughout the winter. keeps out the worst of the cold. and squid they need to stay warm and to grow. The season is turning and storms blow in with little warning. King penguins have also been here all winter. Their chicks survive by huddling in creches to conserve their heat. A solitary bird here standing alone would quickly die of exposure. for year-round fishing in the rich waters of the southern ocean. but that is a luxury that will not last. As the winter storms subside, life begins to return. and most of them arrive in the early spring. over five million pairs of them. and half of them are now here. Courtship is next on South Georgia's busy spring schedule. The wandering albatross has the most elaborate display. These two are renewing their bonds after being months apart. one of the longest partnerships in the animal world. from the coves and the low ground. but that isn't the biggest change facing the king penguins. Their peaceful waterfront has turned into an obstacle course of blubber. The elephant seals have arrived. than any other in the world. their mothers are ready to mate again. The mating rights on this patch of the beach belong to a beach master. females that are coveted by others. His authority is being challenged. but this rival is his equal. but he may have to defend his harem every hour for the next month. many of the young born here next year will be his. and step up to the challenge of getting into the air. THE crucial event in an albatross's life. Weeks can go by like this. the problem is something of a mental one. This bird's feet will not touch land again for five years. the sea ice is only just starting to break. But the Adelie penguins' activities are certainly warming up. just as the weather is improving. Now their courtship can begin. to the males, while they go fishing out on the fragmenting sea ice. It's teamwork that makes killer whales so dangerous. And THIS is a big team. There is no real need for the penguins to be alarmed. 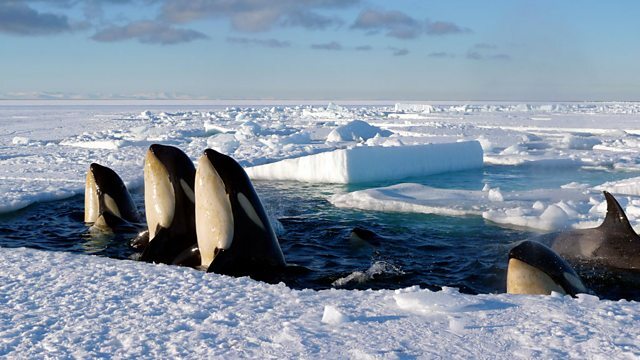 These killer whales are a kind that only eats fish. which cracks lead towards the coast and better fishing. to give their young a head start. and leave before the freeze sets in again. It's a battle they will win or lose over the approaching summer. I've heard so much about it and read so much about it. Finally we're going to get there. It's good. in a location first visited by the early explorers a century ago. that it became known as "the worst journey in the world". to the very limits of their endurance. with enough supplies to survive the next four months working alone in the Antarctic wilderness. in the knowledge that the Adelies' arrival is imminent. But the next morning, things take a turn for the worse. to go and check what it looks like down in the colony. up on the hill. Never really heard anything like that before. and that is, pff, you know, just a mile away or something. So that means that that could get here very, very quickly. So yeah, it makes you slightly scared. It's weird, isn't it? Mark and Jeff retreat to the relative shelter of their hut. "because we haven't seen rocks starting to blow around yet,"
and just at that moment a rock took off and rolled down there. Oh, dear, it's getting stronger. To their increasing alarm, the storm continues to build. and in the last half-hour it's just got a lot stronger. there's the added worry that our gear is stashed outside somewhere. which could spell the end of our trip. On the third day of the storm, the winds hit 130 miles an hour. and Mark and Jeff's situation becomes critical. The wind's rising. Sounds like the bloody roof's coming off. there's a very high likelihood that we'd be dead by now. There's no way we would have seen this through down there. And that is quite sobering. what, if any, equipment has survived. and it's still strapped to this rock. You have no idea how much joy that gives us. We can get on with our jobs now! which come in and batter us from above. Mark and Jeff spend all of their waking hours filming. and Mark devises a novel way of testing the wind speed. might be tiring of their penguin neighbours. Over there's a leopard seal. It's the first non-penguin-looking animal in two months! Will you look at that? It's a leopard seal! trying to get into the shot. We suspect that he might be following us around now. I hate carrying gear. Hear that? I hate carrying gear. I don't want to do it any more. their grip on reality is beginning to loosen. where the penguins go down to the sea. coming back from the sea on the left as you're facing the sea. I'm fairly sure that yesterday they were doing the British system. The legendary Cape Crozier weather soon snaps them back into reality. who has been here several years, saying "With skies like this, you should run for home". But we're just going to stay and film it. working for the BBC doesn't count for much. and the crew are in serious trouble. which looks like it's got about 80mph winds blowing down it. So it's going to be quite an adventure. -of the strength the winds can reach. -Getting a little stronger now! that they could be separated and lost in these white-out conditions. at finally reaching the hut is tangible. Mark, Jeff and the penguins will face many more storms like this. will be to maintain their sanity. Here we are, travelling through the Antarctic by sled. We're being pulled by a herd of huskies. Oh! 12 of them panting out front, breath steaming from their mouths. we see the happy people waving at us. Spring arrives in the polar regions, and the sun appears after an absence of five months; warmth and life return to these magical ice worlds - the greatest seasonal transformation on our planet is under way. Male adelie penguins arrive in Antarctica to build their nests - it takes a good property to attract the best mates and the males will stop at nothing to better their rivals. But these early birds face the fiercest storms on the planet. In the Arctic, a polar bear mother is hunting with her cubs. Inland, the frozen rivers start to break up and billions of tons of ice are swept downstream in the greatest of polar spectacles. This meltwater fertilizes the Arctic Ocean, feeding vast shoals of Arctic cod and narwhal. The influx of freshwater accelerates the breakup of the sea ice - an area of ice the size of Australia will soon vanish from the Arctic. On land, a woolly bear caterpillar emerges from the snow having spent the winter frozen solid. Caterpillars normally become moths within months of hatching, but life is so harsh here that the woolly bear takes 14 years to reach adulthood. Once mature, it has only days to find a mate before it dies. Alongside the caterpillars, white arctic wolves race to raise their adorable cubs before the cold returns. In Antarctica, vast numbers of seabirds arrive on South Georgia joining the giant albatross and king penguins that have been there all winter. Elephant seals fight furious battles over females on a beach that contains the greatest mass of animals on the planet. Finally, the female adelie penguins arrive, chased from the water by killer whales. Mating and chick rearing lie ahead of them.